This is my family’s absolute favorite recipe for chicken pot pie. Even my picky three-year-old and baby eat it! 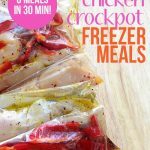 In fact, it’s so delicious that I always prep two at a time – one for dinner and one for the freezer. I’ve been making this chicken pot pie for years. I first shared it back on my blog last year, but this updated version calls for a bit less chicken broth and milk, so it’s easier to thicken the sauce. 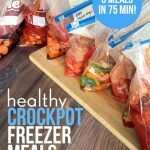 Whenever I prep recipes that require more than 15 minutes to cook, I like to double the recipe and freeze a second for a busy day. 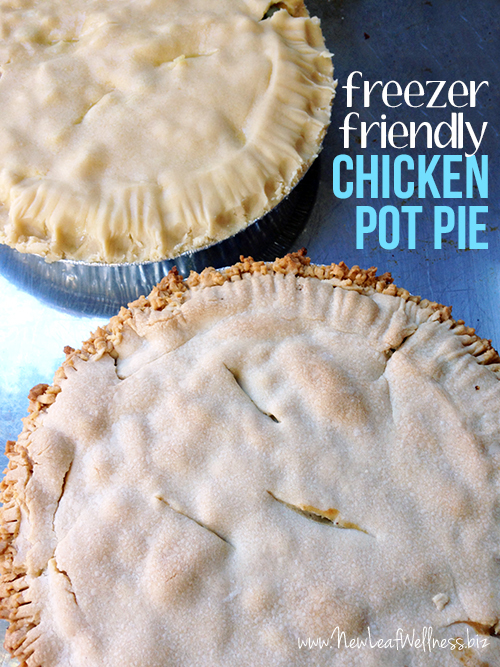 I freeze my second chicken pot pie crust raw so it tastes delicious out of the freezer, not like leftovers at all. What you’ll love about this chicken pot pie is that it’s a complete meal with meat and vegetables. No need for side dishes. Oh, and it’s absolutely delicious. Good old fashioned comfort food, friends. In a large pot, combine chicken, vegetables, and potatoes. Add water to cover and boil for 12-15 minutes, or until chicken is cooked through. Remove from heat, drain, and set aside. In a large saucepan, prepare sauce: Cook onions in butter until soft and translucent. Stir in flour, salt, pepper, celery seed, and poultry seasoning to form a paste. Add chicken broth and milk. Stir and bring to boil for one minute or until sauce thickens. Remove from heat and set aside. Prepare the pie crusts according to directions on wrapper. (For example, you may need to thaw for a few minutes). Combine cooked chicken and vegetables with sauce. Pour half of the chicken/sauce mixture into crust. Cover with top crust, seal edges, and cut away excess. Make 2-3 small slits in the top to allow steam to escape. Bake for 45 minutes, or until crust is golden brown and filling is bubbly. Cool for 10 minutes before serving. Cool remaining chicken/sauce mixture to room temperature. 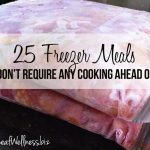 Wrap in wax paper and foil, and freeze up to 3 months. When ready to eat, bake at 350 degrees F for 75 minutes, or until crust is golden brown and filling is bubbly. P.S. 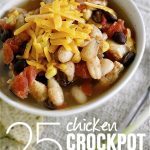 If you love pot pies, check out my crockpot chicken pot pie with tater tots (delicious!) and turkey pot pie (perfect to make after Thanksgiving) too! I love pot pies too. usually only chicken though. I wish I could find frozen gluten free pie crusts! They have to be available somewhere, don’t you think?! Also, try my slow cooker one that’s topped with tater tots! I found gluten-free pie crusts at my local Whole Foods. yum! I am such a fan of chicken pot pie! this looks incredible! I have a recipe for never fail pie crust I will send you when I finish moving next month. Thanks, Michelle. Good luck with your move! Where do I find pre-made deep dish pie crusts that come w a top piece? Is there a brand you prefer? If you buy “double” deep dish pie crusts, they’ll come with two pieces (one for the top and one for the bottom of the pie). I buy the pie crusts that are sold in the freezer section of the grocery store. No brand preference. Non of our local stores carry the double ones. I buy the single deep dish (two pack) and then a pack of the roll out kind to use on the tops. I buy several packs and double or triple the recipe so we have plenty of these. They are a favorite and we bring them to others who may need a quick meal after a new baby or hospital stay.